One day I was at the store where I work and a customer asked me if I had a cat. I couldn't figure out why she was asking that question, when I looked down and saw cat hair on my sweater. I was a bit embarrassed, I must admit. I regularly used paper-tape rollers, but apparently they weren't enough to deal with my cat's shedding. Plus, paper lint rollers start to get expensive after a while since you have to keep buying more rolls when you run out. I got home that night and saw a commercial for a roller called the Schticky. It seemed like the perfect solution because it didn't rely on paper tape to grab the hair and lint off your clothes and other items. Along with that, it could be used to clean certain areas around your house too including ceilings and floors. The price seemed fair so I figured I had nothing to lose and ordered one. Turned out to be a great idea. 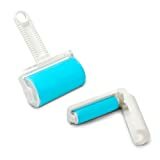 The Schticky is a roller made of silicone. The silicone is sticky, so it quickly lifts up lint and pet hair, but doesn't leave behind any residue. To clean the roller, all you have to do is rinse it under the tap. Let it air dry and it will become sticky again. The Schticky also has a detachable handle that lets you reach high and out-of-the way places. The "Little Schticky" (which you get for free with your purchase) is great for keeping in your desk at work in case you have to spruce yourself up before a meeting or going out for the evening. Unlike paper rollers, there is no waste and you won't ever have to worry about damaging delicate fabrics or upholstery. You will save a lot of money in the long-run too since you will no longer have to buy the paper rolls for your traditional lint-roller. Different size Schticky's work for different surfaces. Schticky doesn't rely on adhesive, so is safe for any fabric, even velvet and silk. No paper waste. Go green with Schticky! Varying sizes allow you to select the right Schticky for each job. Its long handle is rather short: I sometimes need to stand on a chair or step-stool to reach high places with my Schticky. While the Schticky washes off easily, the lint, dust and hair can quickly clog a sink. Rinse your Schticky off in your kitchen sink with your drain filter in place. ​No product is perfect but for me, the pros of the Schticky far outweigh the cons. Best Place for Ordering the Schticky? There are a handful of places online that sell Schticky, but I recommend going through the official website for the best price and bonus offers. If you buy from the official website, you're not only getting the standard sized Schticky, but you're also receiving the "Little Schticky" (perfect for keeping in your pocket when you're out of the house and have a lint or cat hair emergency in public). Also the "Big Schticky" which is the one that comes with the long handle and allows you to clean hard to reach places in your home. We haven't seen these bonuses offered anywhere else and for such a great price. Click Here to order the Schticky from the official website and take advantage of the bonus offers. I've had the Schticky for a few months now, and it works like a charm. It does a great job of trapping lint and cat hair and saves me a lot of time on keeping my home clean. If you're tired of traditional lint rollers not working for you or just being a pain to deal with, I highly recommend you give the Schticky a shot. It's cheap and comes with a money-back guarantee, so you have nothing to lose!